GOP's Cuts To Medicaid Could Threaten Kids' Health Care, Doctors And Parents Fear : Shots - Health News Doctors, consumers and politicians say big federal cuts to Medicaid funding would jeopardize the treatment a lot of kids rely on. The state would either have to make up lost funding or cut benefits. 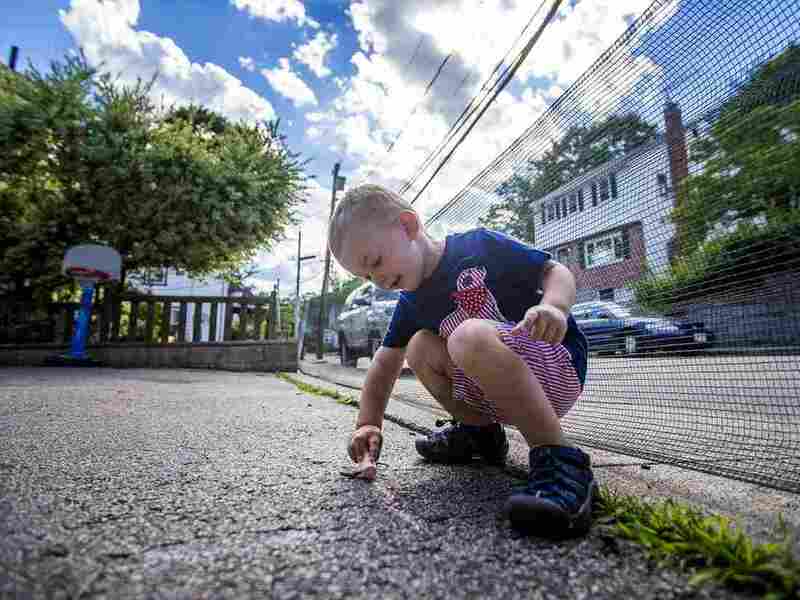 Two-year-old Robbie Klein has hemophilia, a medical condition that interferes with his blood's ability to clot normally. Without insurance, the daily medications he needs to stay healthy could cost hundreds of thousands of dollars or more each year. The U.S Senate's plan to replace Obamacare would cut funding for Medicaid and other health insurance subsidies by more than $1 billion a year within five years. That has many lawmakers, doctors, hospitals and patients across Massachusetts in a state of alarm. "Where in this bill is the protection for children," asks Dr. Jonathan Davis, the chief of newborn medicine at Tufts Medical Center, as he stands in the hospital's NICU among babies who weigh as little as 1 pound. Roughly 60 percent of babies in the Tufts NICU are covered by Medicaid. Davis pauses in front of an incubator that holds a tiny girl, just a few days old, who weighs 2.5 pounds. Her little lungs pump several times a second. "The fact is, she's in room air, so she's breathing entirely on her own — which is great," Davis says. Doctors and nurses will work round-the-clock to give this baby and her roommates the best possible start. But it's unclear whether Tufts could provide this care for free if the baby or her mom didn't qualify for Medicaid. Davis says they also need good insurance after they leave the hospital. "Because if those children don't go home to get great primary care, follow-up, early intervention and support, all those gains that could potentially have been made are going to be lost," Davis says. That threat seems real under the Senate health care bill, says Audrey Shelto, president of the Blue Cross Blue Shield Foundation. "It is even more devastating than the House bill for low-income and vulnerable populations," Shelto says. That's because as of 2025, the Senate would tie spending for each person on Medicaid to a standard inflation rate, instead of the rate of medical inflation, which is usually higher. In Massachusetts, lots of lawmakers — Democrats and Republicans — are frustrated, if not angry. State Rep. Jeff Sánchez, House chair of the Joint Committee on Health Care Financing, reviewed the details on his way to a health care conference. "They talked about repeal and replace," he says. "This is more like search and destroy — because fewer people are going to get coverage that they need, and people will pay more out of pocket." Sánchez says Massachusetts has a longstanding practice of making kids a priority and has enhanced MassHealth to make sure kids in low-income families get the care they need. "Nobody's clear on what's the future of that program," he says. "Everything is up in the air." Sánchez's co-chair, state Sen. James Welch, has called the U.S. Senate bill "class warfare" because it would take money from poor kids and their moms and give it to wealthy adults in the form of tax cuts. But Welch says the state won't have any good options if Massachusetts has to make up $1.4 billion in federal health care cuts in the future. "Do you raise taxes somewhere? Do you cut back on eligibilities? Do you cut back on benefits? Tough decisions are going to have to be made," Welch says. "But health coverage that children are currently receiving — we'll fight tooth and nail to make sure that continues." Eileen McAnneny, president of the Massachusetts Taxpayers Foundation, says the state should cut health care spending before any talk of raising taxes or moving people off Medicaid. But McAnneny says MassHealth, the state's Medicaid program, is growing faster than the state can manage. About 60 cents of every new tax dollar goes to MassHealth. "So we have to reduce the cost of the MassHealth program, or the state will deliver MassHealth services and few others because it will consume a lot of our resources," McAnneny says. For kids, there is one bright spot in the Senate health plan that is not in the House Obamacare replacement bill: About 20 percent of children who qualify for Medicaid because they are severely disabled would be exempt from the cuts. Kayla Klein, of West Roxbury, is watching what Congress is doing closely. She tugs at the appliquéd dog on the front of her 2-year-old son Robbie's T-shirt. Robbie's T-shirt hides a central line port through which he gets medicine every day that he needs to stay healthy; he has the blood-clotting disorder hemophilia. Robbie makes his mom and dad, Joel Klein, laugh a lot. But they're also very worried. Hemophilia medications can be terribly expensive, and the Kleins are both school teachers, without hefty salaries. Robbie has private insurance through his parents to cover most of the cost, and Medicaid is a backup plan, for now. The Kleins want to make sure members of Congress understand the decisions they're making are really important. "Our futures and our livelihood are hanging in the balance," Joel Klein says. "It makes you feel very fragile. It makes you feel like you aren't empowered when your child's life is at stake," Kayla Klein adds. Senate leaders say they expect to vote on their health care bill before their August recess. It's not clear whether the bill has the votes to pass.